Saturday- We left early to go to the credit union in Aurora to obtain a certified check for the car dealership. We arrived, waited, transferred money and the gal gave us the check. We left and drove up to Longmont to pick up the ‘new to us’ 2013 Ford Edge. I had called when we were leaving Aurora so that they could have the car ready. We saw the sign below when we visited the Dermatologist and this time I was able to get a picture. This is a road side sign! We had a chuckle about this! 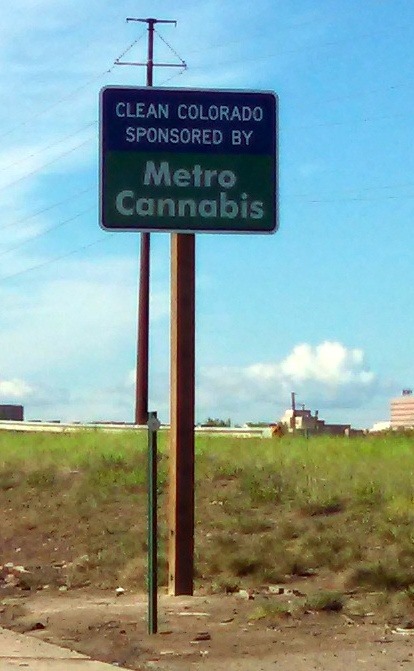 Only in Colorado!!! When we arrived at the dealership we had a very short wait. The title was not ready, but we also need a second key and some paint. They are on order, so we will have to return next week. Bob drove the pick up and I drove the Edge. We stopped at Costco on the way to get gas for both vehicles. We stopped at Enterprise and dropped off the pickup. We returned home, ate lunch and took a much needed nap. After my nap I went to have the manicure I had missed. We went to happy hour at the Lodge, then ate dinner there with all the RV’ers. Tonight’s menu was meatloaf, mash potatoes with gravy, green beans, and salad for $6. We returned to the MH and watched a movie we had recorded. Sunday- The morning was beautiful. The first really sunny day we have had since we arrived. Bright Colorado blue skies. We went to the newer large King Soopers( it is like a Fred Meyers) shopping. What a mistake! Never again on a weekend! The place was mobbed. We returned to the MH and ate lunch. Just as we were sitting down to lunch, a gentleman knocked on the door. He was letting us know that there was a spaghetti dinner, which is a fund raiser for the American Cancer Society. The dinner was 11-5. We took the snow boots back to the storage unit and stopped by Walmart to pick up a few items that were a lot less expensive than at King Soopers. We returned home and stopped by the Lodge. We picked up the spaghetti dinner, $10 each for spaghetti, salad, garlic bread and cake for dessert. We took it as carry out for dinner. At around 3PM the rain started up again, but it had been nice seeing the sun, if only temporarily! We ate the spaghetti dinner and watched TV/read books/played games before bed. Monday- I left to go to my Chiropractor appointment. Bob worked on some tasks around the MH. I returned and we ran to the Post Office to pick up our mail. We opened the mail, sorted through everything and paid one bill. We ate leftovers for lunch. I went to Mahjongg at the MAC at 12. Bob was working on the design for the lights inside the cabinets. I returned a little after 3. It was raining again! We went to the Lodge to meet everyone for happy hour. We returned home and had left overs for dinner. Tuesday- All morning I scanned pictures. Bob left to go pick up a prescription and to go to the Library to return books and pick up a book. We ate more leftovers for lunch. I did laundry all day. More rain, so far we have had rain all but 2 days this month. I spent some time setting up the Sirus radio. We have a free 3 months to enjoy. At 4 we went to the Lodge for happy hour. There were new folks there and we had a nice time getting to know them. We ate dinner at the Lodge. We both had popcorn shrimp, I had rice pilaf and Bob had french fries. We also had salad and green beans. We returned home, fed the dogs and Bob went to the Lodge for the meeting. I stayed home and read my book. Wednesday- Ray Farrell, the car salesman called. The title and second key were ready, so we are leaving this morning to go up to the Longmont to pick them up. We also need them to reset the pin for the Satellite radio. I was able to set up a couple of stations, but not all that we want. We arrived at the dealership and left the car. This is the first time I have ever been to car dealership which did not have a waiting room for service. Strange! They took about an hour. We checked and they had not fixed the pin. So we had the guy come out and check it. He and another service tech finally figured it out and we left at about 11:30. We had checked with friend MariAnne who used to live in Longmont and she had said to go to lunch at the Pump House. We had a nice lunch and Bob had a really nice beer, ” A Beet Cancer Saison”. He enjoyed it. He asked for a sample of the “Peak to Peak Goes”. Goes is a newly popular beer. He liked the sample. We left and returned home to Westminster. We did some tasks around the MH and went to happy hour at the Lodge. It was Bingo night. The Bingo pot is up to 10K, so the place was mobbed. We returned home and no, we do not play Bingo! Thursday- I had my “joint” class for surgery at 8 AM( ugh, too early) at Colorado Orthopedic Hospital. We left at 7:10 and ran to Lakewood to the hospital. We arrived to find a lot of other people there for the class. And these were just the folks for two knee Doc’s. The hospital is part of St. Anthony’s / Centura, where I was in 2012 for the liver stone. After completing a form for the Therapists and receiving a letter from the Pharmacists, we were taken on a tour of a hospital room. It was identical to the room I had in 2012. We were taken to a conference room where a Nurse did the presentation, along with the Physical Therapist and a Case Manager. I could have done both the nurse’s presentation and the Case Manager’s presentation,but it was still interesting. What was really interesting were the questions that people asked. One man has taken off one week from work and was there alone. I suspect that he thinks he can just up and walk out on his new knee, drive himself home, and go to work in one week. I doubt it, but okay, guess he is going to find out. I also don’t think he has anyone at home to assist him. He is supposed to have someone with him for at least 2 days. Glad he is not my discharging problem! The class lasted 2 hours, then we went to Colorado Mills Mall to purchase covers for the new phones. So far, we really like the new phones. We both quickly found covers we liked. Then Bob went to the Best Buy mobile to buy a car charger. He spoke with the guy there and found that the ones that we have will work, although the end of the cord looks different. When we arrived home he checked and yes we can use the cords we have in the car…. While Bob was in Best Buy, I went to Sketchers to see if I could find a pair of slide in walking shoes, with an enclosed heel. I found a pair, but they did not have my size. We arrived back to the MH and sat in the car for awhile connecting our cell phones with the car. it was pretty easy to do, we just had not taken the time to do it. AT 12:00 I went to the Lodge to have lunch with Thelma, Jan, and Marianna. After lunch Thelma left and Julie joined us to play cards. We played “Golf”. The first time I have played this game. It was fun and can be played with any number of people. We played with 3 decks and I won. I think this is the first time we have used our regular playing cards since moving into the MH. I returned to the MH at about 2:30. Bob had called to check on if our insurance would cover the ice machine for my knee. They would not. So I checked on line and made an appointment to be fitted for one. I can use it for both legs and the shoulder when I need it. I had looked at buying one on Ebay, but they did not come with all the parts and when I priced adding the extra items, plus shipping, it was going to be just as expensive as ordering one from Panorama Durable Medical Equipment. Then I went online looking for shoes. I went to all the routine shoe stores, but went to Sketchers online and purchased the ones I had looked at in the store, as they had them available online. This should make life easier for both of us when Bob assists me with putting on my shoes. At 4 we went to happy hour. While sitting there, Paula called. She and Charlie are coming to the Elks next week and I had emailed that the park is full. There is a lot of flooding in the area, so many of the campgrounds are closed. We are okay, as we are on a hill. So I have talked to Julie about a site for them on Tuesday or Wednesday. A new couple we had just met are leaving on Tuesday, so we are giving Julie a check to hold the site until Paula and Charlie arrive. We returned to the MH, ate dinner, and continued setting up our new phones. Bob’s contacts had not come into his phone. Evidently mine have been in the cloud and came right in. I had trouble with my WiFi, but that is fixed. Neither of us have been able to connect our Bluetooth’s to the phones. We may have to go to Verizon to get that fixed. Of course, we went to the happy hour at the lodge, then returned to the MH to bake some chicken for dinner. We watched some TV and read our books. Friday- On TV the weather people were discussing the fact that it is colder and wetter in Denver than in Seattle @ 75, North Pole Alaska @ 73 and Siberia @ 73! Denver was 55 yesterday. More rain today! We left at about 8:10. We stopped at King Soopers for some groceries, then continued on to the PCP office for Bob’s Vitamin B12 shot. We returned to the MH, then I left to go have my hair done. Bob made dog food, did laundry and cleaned the spots we have on the rugs. He also had to pick up the packages that arrived at the Lodge. Bob had ordered some light strips for the inside of the cabinets and our Weather Tech floor mats had arrived for the Edge. Meanwhile, after my hair appointment, I ran through McDonalds for lunch on the way to the Apex Senior Center in Arvada for Mahjongg. The gals at the MAC had invited me to attend and this is the first time I have actually made it. I won one game. I left there and went to a Chiropractor appointment. I returned to the MH to find it locked and Bob not there. He was at happy hour, so I ran down to happy hour. We stayed for the Friday night dinner. We both had Italian Wellington. It was pretty good and we were really enjoying it until Bob found a piece of green bell pepper inside. Oops! He was about half way through. The Wellington was ground sirloin(almost a meatloaf), with prosciutto, cheese and a small slice of green bell pepper, placed on the meat, then wrapped in a crust. It was baked and placed on marinara sauce. There was also fettuccini alfredo on the side. I gave Bob the rest of my fettuccini and I boxed up Bob’s left overs to take home. Bob ordered a slice of cheesecake for dessert. Marianna was the ‘desert lady’ this evening, pushing a cart with desserts around the room. A slice of dessert is $2 extra. We returned to the MH and waited for Bob to get sick. He didn’t, fortunately. We think he found it in time and did not eat any. We had a free Red Box rental, so we watched ‘Lucy’ , with Morgan Freeman and Scarlett Johansson, on DVD.